Three teenagers are in hospital after taking dangerous pills last week. The teenagers, from Bury, took the pills which they thought were the illegal drug MDMA. However, the pills, stamped with the UPS logo, contain a very high dose of Alpha-PVP which caused psychosis in the boys. Police believe the pills are homemade and encourage anyone with any knowledge of their supply to come forward. MDMA, which is often sold in powder form, or in a pill (known as Ecstasy) gives the taker a feeling of euphoria and was an infamous party drug during the 80s and 90s on the Hacienda scene. As well as increasing heart-rate and potentially anxiety, the drug causes sensations of dehydration and overheating, which can lead those who take it to over-consume water, such as the famous and tragic example of Leah Betts in 1995. 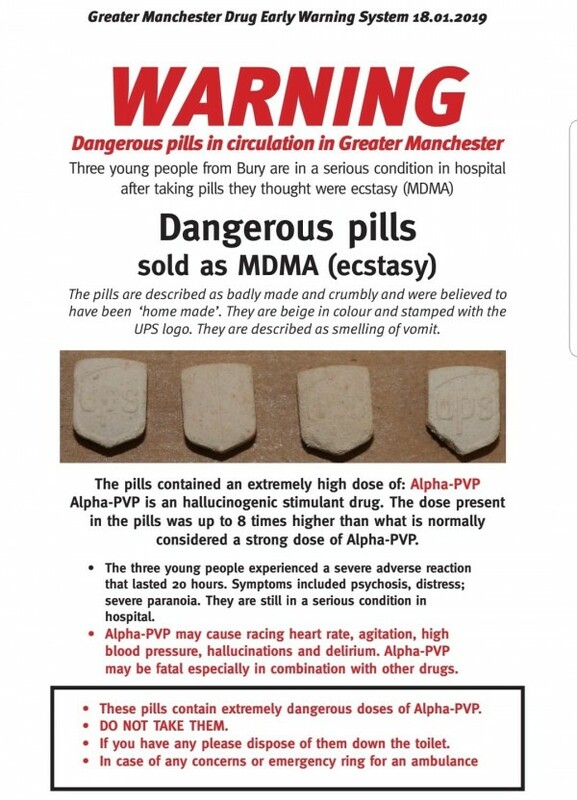 Though MDMA is better known and understood by the public today, fake pills posing as MDMA, such as these cause severe danger as those who take them do not know what to do when they react differently to how they are expecting. If you have taken these pills, or suspect anyone you know has, it is advised you immediately ring emergency services.